Highly automated two-tier conveyance system. Fast picking & packing process. SMC Automation (Malaysia) Sdn. Bhd. 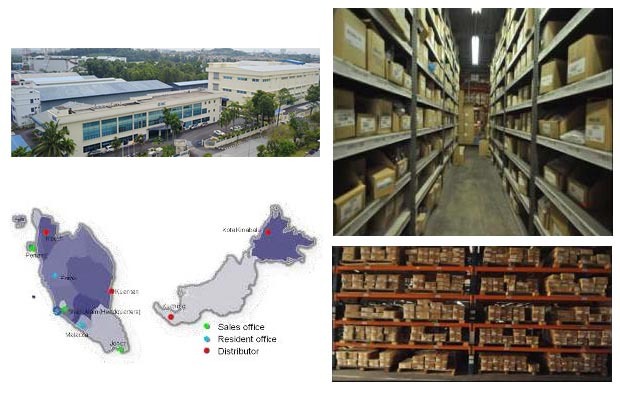 The headquarter of SMC Malaysia is located at Subang Jaya (14,852 m2 ) stocked with approximately 20,000 items inventory. In addition, we have capability to ensure quick delivery to customer with support from the Regional Logistic Center in Singapore. Our extensive network of 4 sales offices and more than 30 distributors meet customers’ needs, thus ensuring prompt delivery and quick services across the country. For detail, please feel free to contact SMC sales. Copyright © 2019 SMC Automation (Malaysia) Sdn.Bhd. All rights reserved. SMC Automation (Malaysia) Sdn.Bhd. is the Malaysia subsidiary of SMC Corporation, the world’s largest pneumatic automation products manufacturer which was established in Japan and now has more than 50 years of experience. SMC Malaysia itself was established in 1978, headquartered in Subang Hi-Tech Industrial Park, Klang Valley, and over the decades, has grown to develop a strong sales network throughout Malaysia with 5 branches. SMC Malaysia’s facilities include a production plant and warehouses storing up to 30,000 variations of the latest advanced pneumatic products of the highest quality, playing an important role in fostering the growth and fulfilling the requirements of industries from a myriad of fields and sectors, including semiconductor, automotive, medical, and petrochemical, just to name a few. Products offered range from valves like air valve, solenoid valve and pneumatic valve, to thermo equipment like thermo chiller and heat exchanger; from actuators, like electric actuator and linear actuator a myriad of electrostatic discharge removal equipment.